All Your Accounts. All together. See your entire financial situation anytime, from any device. Got it! We've rec'd your request - please watch your email for instructions to set up your Dashboard. Interactive charts & detailed views provide increased visibility into your accounts. Know how much you're spending and where. Connect all your accounts & information for an organized, consolidated view. See if you're on target to reach your most important financial goals. 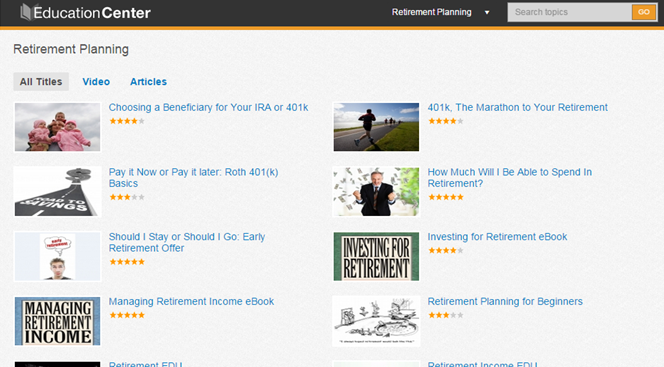 Your own library of videos, articles & resources to increase your financial knowledge. Our Wealth Management Dashboard employs the most advanced security features and protocols to keep your data safe, private & secure, 24/7/365. Comprehensive security protection measures include password protection, secure socket layer encryption, firewalls, intrusion detection, audits, inspections & more. You can be confident that your important information is safe & secure. Your Personal Financial Dashboard provides timely alerts to notify you of important changes to your accounts and investments, important dates, and reminders too. Access your dashboard from any device - tablet, phone or computer. No apps - nothing to download. A team of professionals when you become an investment client. When you become an investment client, you'll work with a team of independent professionals committed to knowing you, your unique financial situation, and your goals. Together we'll build a personalized financial plan that's right for you: well diversified, poised for growth, and built to minimize risk.